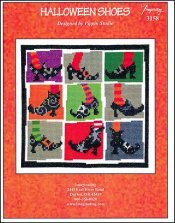 Halloween Shoes [W5336] - $6.00 : Yarn Tree, Your wholesale source for cross stitch supplies. Cross stitch chart from Imaginating. Designed by Pippin Studio. A black shoe with an orange buckle & green socks, or maybe a black shoe with grey swirls & a red sock?!?! A black shoe with a white buckle & purple & orange socks, or perhaps a black shoe with a white buckle & grey dots?!?! "Witch" shoe will you choose?!?! No need to pick just one, you can stitch them all! Stitch count 106v x 110h. Stitched on #2936 Zweigart Aida 14ct White 59" wide or #8221 Zweigart Aida 14ct White 43" wide.